Just last week, I participated in a focus group that was gathering information on an ad campaign for a new Heart and Stroke Lottery. I like being part of a focus group because all I have to do is give an opinion and they pay me for it. I offer my opinion on a daily basis for free to pretty much anyone who will listen. It’s funny what I will do for money. I really should have some moral objection to another lottery that is attempting to separate more money from people who can’t afford it. Instead, I am part of a study that will make the ads more palatable to those who probably shouldn’t waste their money on another ticket. They don’t call lotteries the stupid tax for nothing. The government gets a percentage of the funds (sometimes) and they don’t have to raise taxes to pay for the hospitals or medical research those lottos support. Fewer taxes are a good thing, and $75 for an hour of giving my opinion is an even better thing. This week I agreed to work for the Post Office doing a volume count in April and July. The work is easy and the money is nice too. A volume count is done every few years whenever the management can think of a new way to make the employees to do more work for the same money. I should refuse to do this on principal, but like I said, the money is pretty good and at least I will do a fair count for the carriers. We all justify our jobs, but I suspect few of us really help people in our work. Inadvertently we do I suppose, but the underlying reason we are working is to make money for the corporation. When I was delivering mail, most of what I delivered was bills or advertising which most people would prefer not to receive. I liked days when I would be able to deliver cheques, birthday cards or packages. I wondered if work had always been like it is now. I have always imagined that hunter gatherers would have some pretty good job satisfaction. They would go out for a walk with a digging stick and bring back enough fruits and vegetables to feed the village. Sometimes they might bring down a bird or rabbit which would make the stew for the evening just that much more succulent. Good life! I pictured myself back 10,000 years and wondered what I would have been doing. I’d probably be the guy that went out and came back with mushrooms and the smoking herb. I guess every now and then I would take part in a bison hunt. I’m sure at first I would help build the barriers that would direct the herd of bison off of the cliff. The next year I might get a promotion and get to charge after the herd making noise and waving my hands. The mushrooms would come in handy for that job. The years would go by and I would get more and more important jobs. When you read “important”, you can substitute “deadly”. One of the key jobs is to light fire at the right moment to panic the bison to run over the cliff. 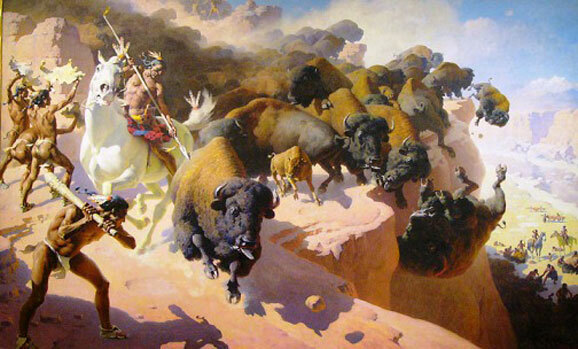 Bison don’t want to run off a cliff that is a person’s idea. I can barely light a match on a calm day, can you imagine if I had to rub sticks together when I was under pressure? What if I couldn’t get the fire lit and the thousand or so bison got to the cliff and decided they weren’t going to jump over? Fifteen hundred pounds each of angry, tired, dusty, angry, mean bison isn’t something that I could reason with, even with mushrooms. Best case scenario of that hunt, would be a hundred of dead bison that need to be processed on site. That’s on site with other carnivores with large teeth and bad attitudes that want to share. I’m not going to mention the bugs and having to carry all of that meat back home, or even the stink. Nope, I think I should stay in the present, collect my pension and give my opinion whenever anyone is willing to listen.